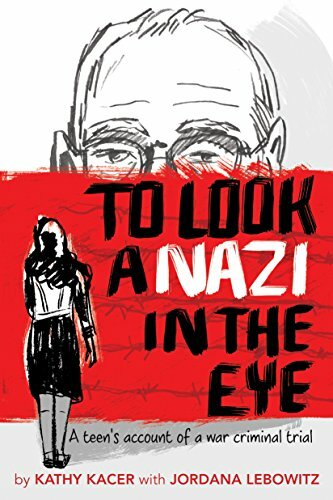 I had the opportunity to interview Jordana Liebowitz and Kathy Kacer, authors of To Look A Nazi In the Eye. The book is about Jordana’s attendance at the 2015 trial in Germany of Oskar Groening, a former SS officer accused of complicity in the murder of 300,000 Jews at Auschwitz. The book raises all kinds of moral questions about history, justice, and values. At 19 years old, Jordana Liebowitz, a Canadian college student, heard about a trial that was about to start in Germany. Oskar Graining, then 96 years old, was an SS officer stationed at Auschwitz. It was his job to organize, handle, and keep track of the property, money, and belongings of the Jews arriving from the rail cars and selected to be murdered in the gas chambers. The press called him the “Bookkeeper of Auschwitz.” The trial wasn’t about whether or not he was an SS officer at Auschwitz — he didn’t deny any of it. Instead the trial was about his guilt as an accessory to the murder of 300,000 people, though, he, himself, was a junior officer and never directly killed anyone or ordered any killings. Jordana was determined to attend the trial. She convinced her family to allow her to fly to Germany and, through a lot of chutzpah, got herself attached as an observer to the team of lawyers and Holocaust survivors who were going to prosecute the case and offer testimony. Kathy Kacer, an author and the daughter of Holocaust survivors, heard about Jordana’s efforts and wrote a book, To Look a Nazi In the Eye, as an account of Jordana’s experience. Take a listen to the interview. You can find To Look a Nazi In the Eye here.